Part of the enjoyment of homebrewing for me is designing and advancing my home brewery. 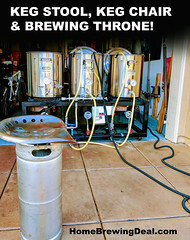 I always enjoy seeing what other home brewers are using, how they have their homebrewing equipment configured and love to see what they are working on next. 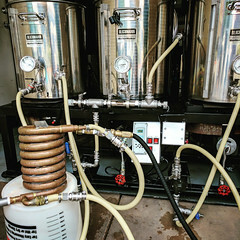 Here is my current brew rig, homebrew fermentation setup and some of the home beer brewing components such as wort chiller and kegs that I use. If you want more details on any of the items you can click on the image. Also, please feel free to reach out to me if you want to chat about anything. I would love to see photos of your gear! 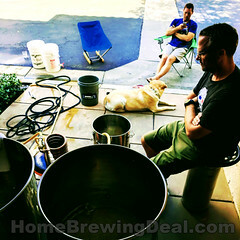 I currently use Blichmann 20 Gallon Kettles, but typically brew either 5 gallon or 10 gallon all grain homebrew batches. Homebrewing rig top view. You can see the Blichmann stainless steel false bottom and the RIMS heating bar and RIMS Temperature controller for mash temperature control and stabilization. I keep my pumps recirculating during the entire mash and the temp controller and heating element keep my mash temp at exactly what I set it for while I drink a beer! Homebrewing rig RIMS configuration. I built my own setup with a Ranco Dual Stage temperature controller that links to a stainless steel heating element that is housed in a larger diameter stainless steel tube. 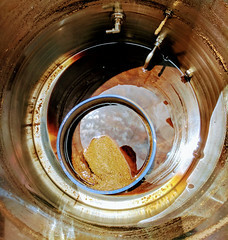 There is a thermowell on the other end of the tube that feeds back to the Ranco so that it know when to activate the heating element in the RIMS homebrewing system. I wired it so that the temperature regulator can not be activated unless the homebrew pump is running so that I do not burn up the RIMS system if I have one too many beers and forgot to place the mash tun in recirculation. I typically ferment with these two stainless steel homebrewing brew bucketfermenters, but also use carboys, kegs and a 14 gallon stainless steel conical fermenter. Here is my fermentation chamber. I reside in Southern California and during the summer temp can hit 100 F so I converted this chest freezer over to a fermentation chamber for my home beer brewing. I use a Johnson temperature controller to regulate the fermentation temperature of my homebrewing fermenters. 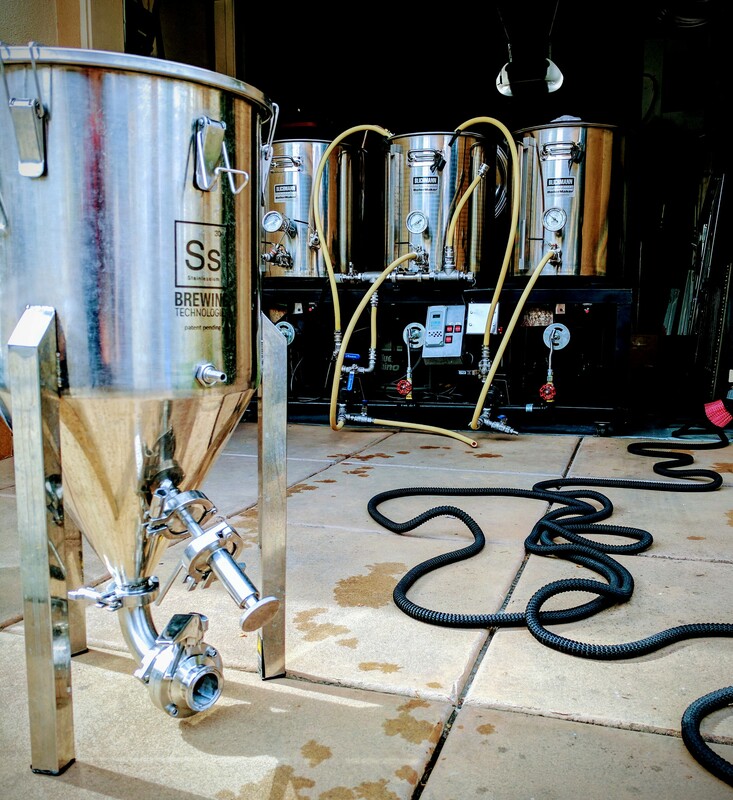 An update to my homebrew setup, I just purchased 2 new stainless steel home brewing conical fermenters. A 7 gallon SS Brew Tech Conical fermenter for my 5 gallon beer batches and a 14 stainless steel conical fermenter for my 10+ gallon home brew batches. 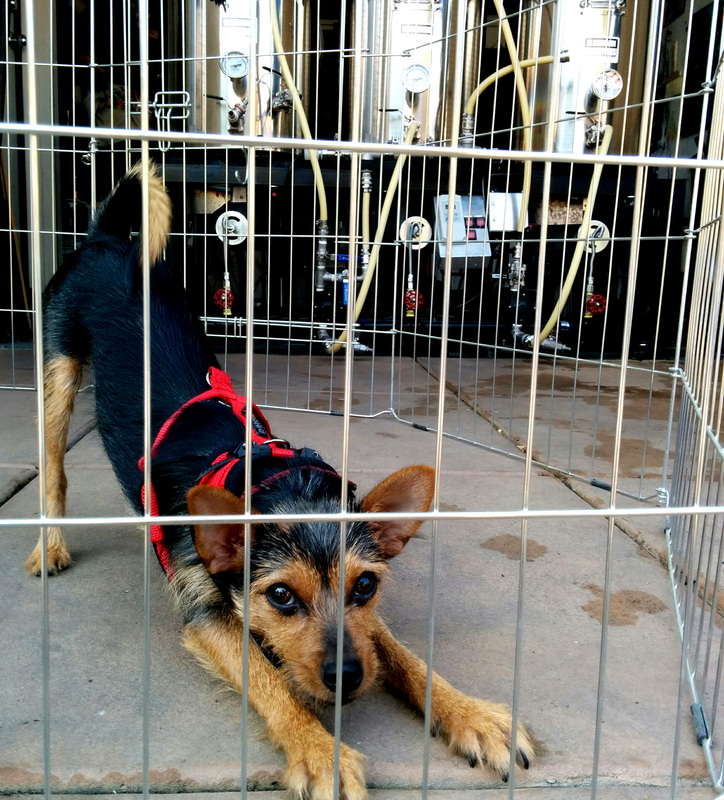 Those are the basics on my home brewery setup and homebrewing rig. If you have any question on it, or would like to know how or why I setup anything the way that I did please reach out. I also always like feedback and suggestions on how I can improve it so please leave a comment or shoot me an email! You used your ingenuity in creating a technical masterpiece. I can’t believe you created such an intricate thing!